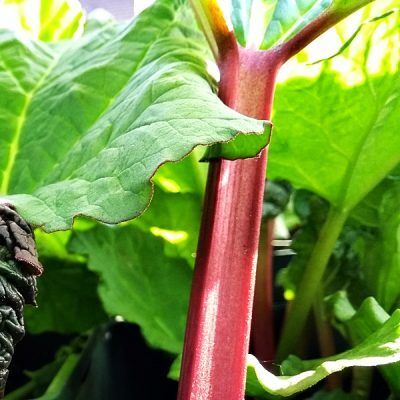 Our Rhubarb Plants at James McIntyre & Sons are becoming more and more popular, with our current range offering excellent variety, with 3L plants available, or bare-rooted plants available for order between late October and late March. The varieties we supply are best lightly picked in the first year, allowing the plants to become fully established and produce large amounts of delicate, tender stems the second year, with our Glaskins Perpetual, Timperley & Victoria plants all being extremely popular varieties. 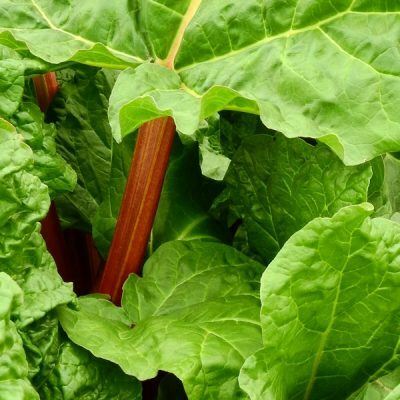 Rhubarb Plants are know for their extremely hardy nature, disease resistance and are very easy to grow and establish. Some varieties can also be forced (grown under a large pot or rhubarb forcer in darkness) or left to grown naturally. 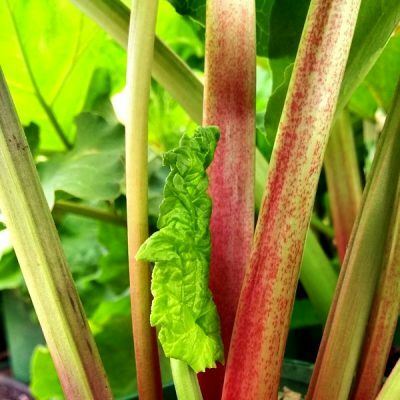 Rhubarb is not fussy as to soil but should be planted in slightly raised beds if the soil is very heavy. It does, however, need an open site as it will not tolerate shade. Prepare the soil carefully by digging to two spits (spade depths), the roots go deep, and work in plenty of farmyard manure or compost as you go. In choosing a site remember that the leaves are heavy and reach at least 2 feet (60 cm) all round the crown. 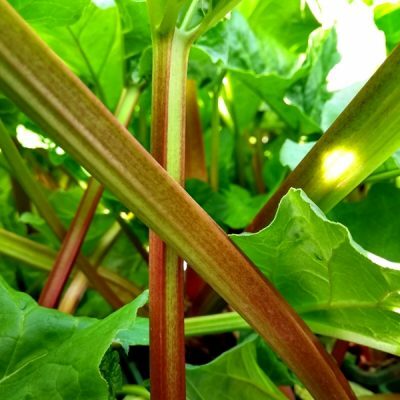 All varieties of rhubarb develop a deep root system and grow best in a fertile, partially shaded, free-draining soil. Start digging over your soil four weeks before planting, removing any stones you find and adding as much organic matter as possible. Plant in sun or partial shade, on moist but well-drained, humus-rich soils. Keep in mind that many varieties grow to be very large plants, and require a lot of space. Before planting, dig a hole with a trowel a little bit wider than the crown/plant. The depth should be such that the top of the plant is at, or just below the soil surface. Gently firm the surrounding soil and water well. Spacing between plants should be about 75cm (30in) for smaller varieties, and up to 120cm (48in) for larger varieties. the soil surface in late February or March. 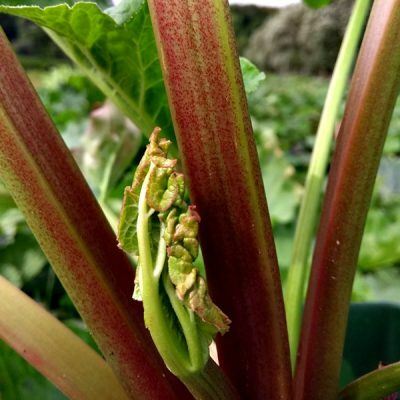 Rhubarb suffers from few diseases. Crown rot is the main threat, particularly if soil conditions are wet. The fungal infection occurs at the base of the stalks where crowns turn brown and soften. Plants suffering from rot should be dug up and destroyed immediately. To avoid crown rot, make sure rhubarb is planted in fertile, well-drained, weed-free soil. This simple process provides an earlier harvest of sweeter stems that don’t need peeling. For forcing outdoors, cover plants with a container or large pot to exclude the light. 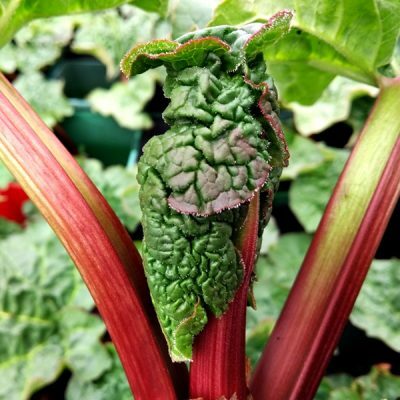 Place the cover over the rhubarb as soon as it begins to show signs of growth. For forcing indoors, lift whole crowns in November and place them on the soil surface to be chilled for two weeks in order to break their period of dormancy. Pot each crown up with compost and bring into a cool greenhouse. It’s important to completely exclude any light by placing forcing pots or black polythene over crowns. The lack of light and the heating effect of the cover will quickly cause the rhubarb to ripen and it will be ready to eat within four weeks. Allow rhubarb to establish for one year before taking your first harvest. Select three of the largest stalks, waiting for the leaves to fully open before pulling from May to August. Stalks are harvested by gently twisting the stems and pulling from the base of the plant. Leaves shouldn’t be eaten as they contain oxalic acid and are poisonous.